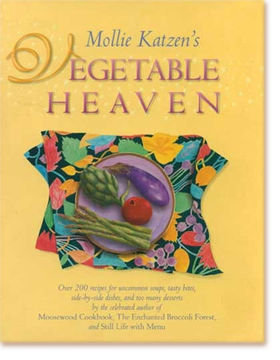 Author of the popular vegetarian classic Moosewood Cookbook, Mollie Katzen now offers Mollie Katzen's Vegetable Heaven, another celebration of nature's bounty. The book (illustrated in full-color by Katzen), presents more than 200 approachable recipes for a wide range of vegetable dishes, from openers, soups, and side dishes to pastas, condiments, and entrees. The recipes draw freely from diverse culinary styles, and cooks of all kinds should enjoy the dishes, as well as Katzen's casual, spontaneous tone. Standout recipes include ROASTED EGGPLANT SALAD WITH MUSTARD VINAIGRETTE, TOMATO-FENNEL CONSOMMÉ, GIANT MUSHROOM POPOVERS, and FRITTATA WITH RED ONIONS, ROASTED GARLIC, GREENS, AND GOAT CHEESE. The book's "Side-by-Side" chapter, a collection of small dishes meant to be served together, features bean and grain delights like COCONUT RICE WITH GINGER, CHILIES, AND LIME, TUSCAN BEAN AND PASTA STEW, and "DON'T KNOCK 'EM TILL YOU TRY 'EM" SOYBURGERS. Condiments and sauces are used to enliven simple vegetable fare and Katzen accordingly offers recipes for such flavor boosters as RED ONION AND SHALLOT MARMALADE, SUMMER FRUIT SALSA (with mango, strawberries, raspberries and nectarines), and CHIPOTLE CREAM. There are dessert recipes, too, for old favorites like GINGER THINS and HOMEMADE BUTTERSCOTCH PUDDING and enticements like MEXICAN CHOCOLATE CAKE, PINEAPPLE POMEGRANITA, and BLUEBERRYLEMON MOUSSE PIE. With a selection of seasonal menus and useful ingredient notes, the book brims with modern vegetarian cooking ideas presented in Katzen's much-loved style.